First In First Out Inventory Management and Shipping-Is It Better For E-commerce? Home eCommerce First In First Out Inventory Management and Shipping-Is It Better For E-commerce? Retail eCommerce sites sold over $445 million worth of products in 2017 in the United States alone, and that’s only retail. There’s no denying that eCommerce is one of the most booming forms of shopping. If you run an eCommerce site, you know that the competition is stiff. Because of this, you should always look for better ways to improve your business. You never know what small change could make your business soar. When it comes to shipping, you may consider using a first in first out inventory (FIFO) method for your store. But you might have some hesitations. Lucky for you, this article will tell you everything you need to know about the FIFO method. What Is First in First out Inventory? In short, the FIFO method is what it sounds like. The first products you buy are the first ones you sell. FIFO isn’t only a strategy. Instead, it’s an accounting method that the IRS says a business can use to calculate its cost of goods sold. Your cost of goods sold is the amount of money you spend on buying products that you then resell. Knowing this number is helpful for you because you can put it as a business expense for your taxes. This lowers your taxes for you. It works by adding up the amount of each product you sold. This also helps you because it keeps track of which products you’ve already sold. And because most businesses work with a FIFO mentality, it makes it an effective way to keep track of business. How Can First in First out Inventory Help Your Business? As a business owner, you want to make sure you have oversight over your business. Even if you aren’t anything close to a micro-manager, having set structures in place can give you and your managers peace of mind. One minor structure you can set up is FIFO. FIFO is a simple addition to your employees’ work days that can have great benefits. It won’t change everything about your business of course. But it could give everything a little more structure. And structure means security. FIFO is also helpful when you hire new team members. 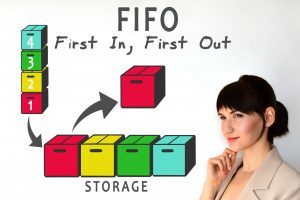 Most people with warehouse experience will know what FIFO is. This means there will be less training time when hiring new employees. Let’s say your delivery team does the packing for you. Even if they are a great team, odds are they may get confused at sometimes. Because they may have many clients, they might confuse your packing method with another business. Why? The majority of businesses use FIFO in their warehouses. It’s a uniform structure. Using this method will make your delivery team more efficient. This could save you both time and money when working with an outsourced delivery team. Even with an in-house delivery team, FIFO is an effective form of stocking your products. This will keep them working fast as well. Let’s say that you ship or sell food products. Using the FIFO method can help make sure that you give your customers the best product. Because food has an expiration date, you want to make sure that you’re selling the newest product. If you don’t, you may accidentally sell something spoiled. Even if you aren’t in the food business, using the FIFO method could be helpful to you as well. Some products deteriorate or age over time, and using the FIFO method will make sure that doesn’t happen. Not only is this great for customers, but it also will save you money in the long run. You won’t have to worry about throwing out old milk or customers asking for returns when their product has gone bad. 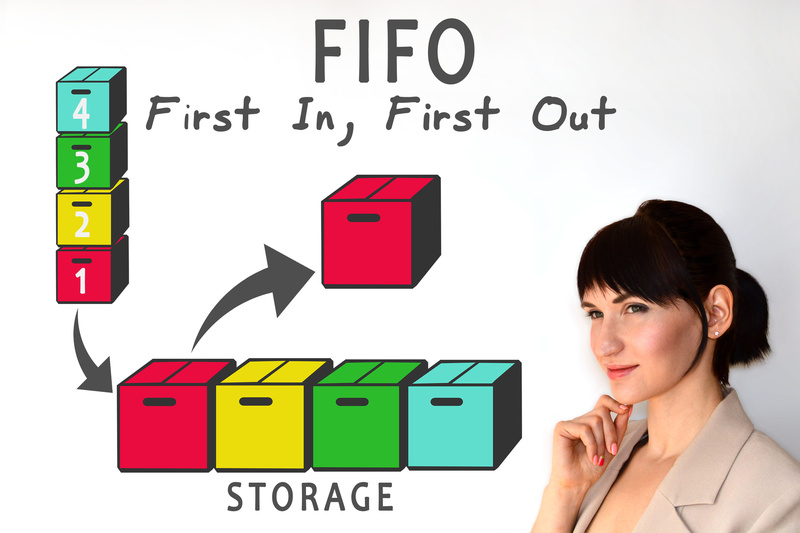 With FIFO, you can make sure your business always has easy access to items. This means that you can easily get items when they are popular. It also means it’s easier to clear those items out when they lose popularity. If your business has a special sale, you’ll be sure to have them ready to go with FIFO. You may know this already, but FIFO isn’t the only accounting method accepted by the IRS. In fact, there are three other main methods, and we’re going to discuss them here. Chances are that average cost is not going to be the most effective option for your business. Even though it is simple, it won’t be as accurate as FIFO or other options. Average cost is making an average of what the cost of all the items you sold was. So, let’s say you sell all your items for an average of $6.28, and you sell 1,000 products. That means your cost of goods sold is $6,280. LIFO is the exact opposite of FIFO. LIFO stands for last in first out. LIFO works as well as FIFO in some businesses. Businesses that aren’t worried about their products deteriorating might want to consider it. The downside to FIFO is that it’s not effective for fad items. You don’t want to sell items that were popular a month ago. If your business has a regular system, LIFO may work best. As an eCommerce business, chances are you won’t be using specific identification. This is when a business has specific products that cost a certain amount. A good example of this would be expensive jewelry. While it may work for those products, you wouldn’t want this for a business that ships a lot of product. Looking for More About Warehousing? After reading this article, making a decision about the first in first out inventory method should be a breeze for you. Even if you choose not to use it, consider finding a standard practice for your eCommerce site. Are you looking for a way to get started with same day shipping? Get in contact today.